Dr. Dwyer was born in New Orleans and lived there until 1978. He graduated from Jesuit High School, the University of New Orleans and Tulane Medical School. He spent one year in an internal medicine internship at Ochsner Clinic in New Orleans in 1976-77, one year as a physician for Tulane University students in 1977-78, and then three years in a dermatology residency training program at the University of Arkansas for Medical Sciences in 1978-81. Dr. Dwyer was elected to the AOA honor medical society while at Tulane University. He was board certified by the American Board of Dermatology in 1981 and is a fellow in the American Academy of Dermatology. He is also a member of the AMA and Pulaski County and Arkansas State Medical Societies. 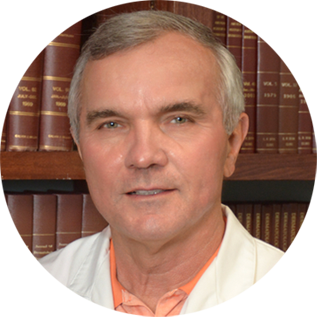 Dr. Dwyer joined the Little Rock Dermatology Clinic in 1981 and practices medical and surgical dermatology with a particular interest in skin cancers and psoriasis. He sees patients of all ages. He is married to Debbie and has 3 children, Dayna, Casey and Kelley. His active interests include golf, biking, hiking and college sports.